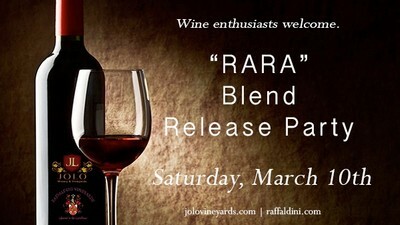 Pilot Mountain and Ronda, N.C., February 15, 2018 – On Saturday, March 10, 2018, JOLO Winery & Vineyards and Raffaldini Vineyards will host back-to-back special release events for their second red wine blend collaboration, RARA Sisboombah. The wine is a collaboration among longtime friends, JW Ray and Jay Raffaldini. Both men are dedicated to producing higher quality wines and serve as passionate advocates for the growth potential of the Yadkin Valley wine region. This year's RARA Sisboombah was produced by blending JOLO's 2016 Crimson Creek “Reserve” with the 2016 Raffaldini Montepulciano Riserva. The inaugural offering sold out in less than three days. "My reverence for Jay for bringing old world wine techniques to this region to massage the European varietal characteristics out of North Carolina grapes cannot be overstated." JOLO founder JW Ray said. "The entire Raffaldini team continues to raise the bar for all of us. Jay is a true visionary and an inspiration. I’m very fortunate to call him a great friend. I couldn’t be more excited about this 2nd bottling of this world-class wine." Raffaldini and Ray will co-host two gatherings on Saturday, March 10th, where they will share their winemaking stories over light refreshments. The first event will take place at Raffaldini Vineyards beginning at noon. Reservations can be made by clicking here. The second gathering will begin at approximately 2:30 p.m. at JOLO Winery & Vineyards. This event is open to the public. In mid-January we announced changes to our wine club. The wine club will be referred to as the Superiore Club and will be a 12 bottle semi -annual commitment (6 bottles chosen by us and 6 bottles self-selected). We have added additional tiers to give our guests more options and experiences than ever before. We are excited to introduce our Classico Club. Our Classico Club is an annual, individual tasting pass and entitles the member to one tasting or glass of wine with each visit to Villa Raffaldini all year long. Make plans now to attend the North Carolina wine industry's biggest event of the year. The NC Fine Wines Competition is the toughest state-specific competition in the country, and you can be side-by-side with owners and winemakers from across the state when the coveted NC Fine Wines case awards are announced! Dress to impress and attend the awards ceremony and exquisite dinner paired with NC Fine Wines. Only a few seats remain. Raffaldini Vineyards is proud to be a sponsor of an Evening with the Master Chefs. This invitation only, elegant evening of dining, aromatic wine, and charitable giving is scheduled for Saturday, March 3rd at the Quail Hollow Club and will feature top chefs from throughout the Southeast all in one kitchen to prepare a seven-course meal of culinary delights. Proceeds from An Evening with Master Chefs benefit the work of the Cystic Fibrosis Foundation. Your tax deductible contribution will help students pursuing wine-related degrees at NC colleges and universities.The NC Fine Wines Scholarship Fund is a 501(c)(3) fund that accepts both tax-deductible contributions and matching grants by many corporations. Thank you for considering the NC Fine Wines Scholarship Fund for your charitable giving. Learn More at www.ncfinewines.com. Join us for “Amore! The Language or Love." This is a complimentary, family friendly event. The upstairs of Villa Raffaldini will be transformed into a dance floor. Dance with your loved ones as you are serenaded with a classical guitar performance by Samuel Taylor. Wine and flowers will be available for purchase. Our underage guests can create their own Valentine’s Day cards with crafts provided. The Pino Vino Wine Label Competition is coming to a conclusion with this year’s label. Throughout the last ten years, many of you have participated in the Pino Vino wine release by submitting your rescue animal for consideration to be on each year’s label. Raffaldini Vineyards has been honored to host this competition, and we have all grown to appreciate even more the efforts people make to rescue animals. In its first year, Pino Vino featured the Raffaldini family rescue dog, Pinot, who originally hailed from Athens, GA. Over the years, various local rescue organizations have received donations based on the sale of Pino Vino wine. While the Pino Vino X label has been chosen, it will not be the end of Raffaldini Vineyards' participation in animal rescue organizations. Please mark your calendars now to join us at Raffaldini Vineyards on June 16, 2018 for the release of Pino Vino X.